I first read these dialogues a few years ago, not long before I started blogging. My son was sent Protagoras and Meno when Penguin did a pot luck book giveaway. When I saw what he got I thought, How unfortunate – or words to that effect! I thought it would be dry and dusty but I was completely wrong. This translation by Adam Beresford is a really enjoyable, smooth read and it even has humour. So I was happy when I realised that The Classics Circuit was having an ancient Greek Tour because it gives me the opportunity to spread the word to anyone else who hasn’t read it. The dialogue begins with Socrates speaking about Protagoras the famous sophist to a friend and gives him the news that Hippocrates had woken him, wildly excited because he had heard that Protagoras was in Athens. The young Hippocrates wants to pay to become a pupil of Protagoras but Socrates isn’t so sure that he should do so. What does Hippocrates hope to gain from it and doesn’t he realise that he’ll be handing over his soul not knowing whether it is to something good or bad? Hippocrates thinks he knows what a sophist is – it’s someone who has sophisticated knowledge and is a master at making people skilled at speaking. Socrates points out to Hippocrates that he wouldn’t hand over his body to someone if he didn’t know whether it was going to end up in good or bad shape. So why would he be less careful with his soul? Socrates and Hippocrates end up going round to Callias’ house where Protagoras is and continue the philosophical conversations with more sophists. I found it very interesting anyway. Meno is a dialogue mainly between Socrates and Meno but also involving a slave and Antyus a politician. It’s about virtue, and Meno asks if goodness can be taught, or is it natural to some people? Great stuff! 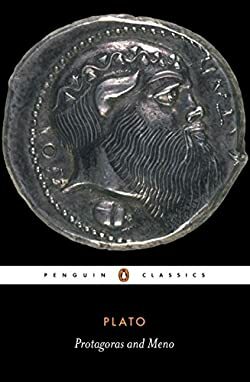 I recommend it to anyone who is a wee bit wary of Greek philosophy, as I was. Thank you Rebecca for organising the tour. The Belton Estate was first published in serial form in 1865 and for some reason seems to have been quite neglected over the years. I have to say that I really enjoyed it and it was a very quick read for me. It’s another story featuring that dastardly thing – an entailed estate. Belton Estate is owned by Mr Amedroz, a widower with a grown up son and daughter, so the entailment shouldn’t be a problem. However, the son Charles has been indulged and spoiled by his father and after spending all of his father’s money and leaving nothing for his sister Clara’s future – and being the selfish, self pitying swine that he is, he commits suicide. Clara is now in dire straits with no money and an ailing elderly father. When her father dies she’ll be penniless and homeless as the estate passes on to a distant cousin Will Belton. Clara fancies herself to be in love with Captain Frederic Aylmer who is a relative by marriage and a Member of Parliament (usually a bad sign), so when Will Belton, an honest, shy and gentle chap falls in love with Clara she turns his offer of marriage down. Silly Clara, but it had to be done, for the sake of the book. Clara’s father is sure that the wealthy Mrs Winterfield who is Clara’s aunt by marriage will provide for Clara in her will and so thinks that he has nothing to worry about but Clara knows that her aunt is going to leave her estate and money to Captain Aylmer. Eventually Captain Aylmer proposes marriage to Clara and she accepts but it isn’t long before she is comparing him with Will Belton and as Frederic is a cold man who never seems to be able to behave the way a fiance should to her, things begin to cool. When Clara’s father dies she goes to stay with her prospective in-laws, whom she hasn’t met before and it’s obvious that Frederic’s mother and sister are dead against him marrying Clara. That’s as far as I’m going with the story, because I don’t want to spoil it for people who might want to read it. Previously I’ve read The Barchester Chronicles, and I loved those books, so funny. Trollope must have known a fair amount of ghastly women in his time because he writes them so well. Mrs Proudie, the bishop’s wife, is wonderful in her awfulness. But what struck me about The Belton Estate is that my copy had originally belonged to my mother-in-law. We inherited it along with a bookcase full of books so I’m fairly sure that she read it. We’ve been married for over 34 years and it’s taken me till now to discover who my mother-in-law took as her role model. It was the tyrranical Lady Aylmer of course, Frederic’s mother! Charles Dickens often wrote about the conditions that poor people had to suffer, because he had been there himself and presumably hoped that he could help by writing about the inequality of life. Trollope, who was of a different class seems to have been trying to do much the same thing for the women of his own class who were put in a difficult position by entails. He’s also very sympathetic to women who were often harshly judged for what would be seen as a small misdemeanour if committed by a man. It seems to have taken another 20 years for entails to be abolished, by the Reform Bill of 1885. Anyway, I recommend The Belton Estate as a good read, especially if you’re a bit wary of Anthony Trollope’s work. Amanda at The Zen Leaf has decided to read a classic book each week, which I think is a great idea, and as I decided that I’m not going to do any challenges in 2011 I’m going to be doing something similar. This is a list of 52 books which I’ve compiled from various book cases and piles in our house, it’s a mixture of books which I’ve bought and inherited and this is just scratching at the surface of the unread books here. They aren’t all classics but most of them are pretty old, some are quite obscure I think. I’m hoping to read and review one a week which I should manage quite easily even although I don’t skim read. I’m planning to have a sprinkling of seasoning in between in the shape of vintage crime, books recommended to me, any others from my book piles that shout READ ME, and newer books via the library. Well, I make that 52. I’ve just finished reading Anthony Trollope’s The Belton Estate which I’ll be reviewing at The Classics Circuit on December 10. I’m about to start on Rosamunde Pilcher’s September and after that it’s the biggy, yes – War and Peace. I may be some time! I’m going to start reading Willa Cather’s Death of the Archbishop soon, so I was really chuffed when I paid a call on Christopher at ProSe last night and discovered that his new post was about his recent visit to Nebraska and Red Cloud, where Willa lived. His photographs are lovely and the houses are perfectly American, picket fence and all. So if you’ve missed it, do yourself a favour and have a peek now. One of the houses featured is linked with the book My Antonia and is in need of some TLC apparently as is Robert Louis Stevenson’s home in Edinburgh, which you can see here. It really annoys me when literary history is just left to rot like this. On the reading front, I’ve just finished Ian Rankin’s Let It Bleed. Does anybody else want to join in with the discussion on this book over at Judith’s ? (Reader in the Wilderness) I’m usually more of a vintage crime lass but I think I’m really going to get into the Rebus books. I’m now nearly half way through Dracula and I’m really surprised at how much I’m enjoying it. Last night I decided to read War and Peace, I’ve been putting it off for years and the only way of doing it is to have a deadline, I think I have to finish it by January the 19th when there is going to be a discussion on it. Last but not least, The Classics Circuit has started up again after a bit of a rest and the next tour is a Trollope one. I’ve signed up to read either The Belton Estate or The Claverings, which happen to be the only two of his which I have in the house but haven’t read yet. I mustn’t forget Rosamunde Pilcher’s The Shell Seekers either. The copy of this book which I read was one which had originally belonged to my husband’s grandfather. It’s one of many books which we inherited from him and so is very old. I think that the title was changed to A Nest of Nobles at some point. Although this is a very old translation, dating from 1869 I think, it’s a very good one as the book is really easy to read and doesn’t seem to be stilted or clunky in any way. The only Russian authors I’ve read previously are Dostoevsky, Sholokov and Solzhenitsyn so I didn’t know what to expect with Liza. However, on one level this was a very straightforward read, the only difficulty is the number of variations of names which the characters are known by, but when I think about it, I am called by lots of different names, depending on who is speaking to me. I found the book to be a bit predictable but that didn’t spoil my enjoyment of it. Liza is a pretty and charming 19 year old, the daughter of a widow, Maria Dmitrievna Kalitine. They live in the town of O. and she has attracted the attention of an ambitious 28 year old, Vladimir Nikolaevich Panshine who works in the Ministry of the Interior and is already a chamberlain. Fedor Ivanovich Lavretsky arrives unexpectedly in the town of O. He is a relation of Maria Dmitrievna and is estranged from his wife Varvara Pavlovna Korobine who is the subject of gossip all over Europe. Lavretsky had met his wife in Moscow where he had enrolled as a mature student after the death of his father. Whilst there he had seen Varvara in a theatre box and had instantly fallen for her. He arranged to meet Varvara and her parents and as Lavretsky was wealthy they were keen on a match with him. Varvara’s father soon took over the running of Lavretsky’s estate as he wasn’t interested in business. Meanwhile Varvara and Lavretsky travel around Europe with Varvara becoming a society hostess, eventually reaching what was her idea of success – Paris, where her drawing-room was frequented by a variety of social climbers and ne’er-do-weels including a newspaper gossip columnist. Eventually Lavretsky discovers the true character of Varvara, and for him the marriage is over. He meets up with his distant relations again after deciding to take up residence in his nearby estate and sees Liza whom he hasn’t seen since she was a small girl. So, you see what I mean about it being predictable. The most interesting thing about this book is Turgenev’s attitude to what was normal behaviour in high society. He was at least two generations ahead of the times, even for people who weren’t ‘high-born’. This would have been around about the time that Sir Walter Scott’s books were wildly popular throughout Europe and there was a mania for all things tartan and Scottish. The upshot of such behaviour is that the rich people have no knowledge of what should have been their own culture and return to their homeland as strangers with no feelings for or experience of the natives. Not even able to speak their mother tongue properly. This still happens in Scotland, the landed gentry, clan chiefs and such like habitually send their sons to be educated in England, most usually at Eton. So you have the ludicrous mixture of a man in a kilt and sporran and yes a feather in his hat, but speaking with the plummiest English accent imaginable. They have absolutely no idea of real Scottish culture as the only thing they do is hunting, shooting and fishing on their estate. Turgenev also comments on the plight of foreign workers, something else that hasn’t changed much. Liza’s piano teacher is a German called Lemm and when he was young he decided to travel to Russia to make his fortune and name as a composer there. However after working for seven years in the household of a nobleman who hasn’t paid him for his services he discovers that the nobleman has squandered all of his money so Lemm has to depart penniless. He is too embarassed to go home and stays on in Russia as a poorly paid and under-rated teacher. It’s quite depressing that nothing seems to have changed in all the years since Liza was written, but such is human nature and life. I’ll definitely be reading more Russian literature now, thanks to The Classics Circuit and everyone involved with it. Germinal was first published in 1883 and at 536 pages I must admit that I thought I might have bitten off more than I could chew considering this was my first foray into French literature. However, the pages whizzed past and I must put in a good word for Roger Pearson who made such a smooth job of the translating. I especially liked the fact that he used the Scottish word ‘piece’ meaning sandwich. I really enjoyed reading this book, although that does seem a strange thing to say because there certainly isn’t much joy around. Things just lurch from bad to horrendous. The story begins with Etienne Lantier, an unemployed mechanic walking through the countryside on a freezing cold dark night, penniless and starving. When he reaches a mining complex he is interested in the lay-out of the place and hopes he might be able to find work there, which he does. After his first shift he decides that the work is too hard and that he will move on, but when he realizes that the miners and their families are in dire straits, he decides to stay on, hoping that he will become a leader of the miners eventually. Zola writes very realistically of the bitching and gossiping which goes on in a small close-knit community. You can’t help thinking that the French workers don’t seem to have benefited at all from the French Revolution. The contrast between the miners and the mine owners is vast. Zola seems to be a sort of French version of Charles Dickens, highlighting the appalling working conditions of the common man. However M. Hennebeau is lonely in a loveless marriage with an adulterous wife and can’t help envying the miners their ‘free-love’ lifestyle. The grass is always greener. Things come to a head when the mine owners inflict what amounts to a pay cut on the workers, who already couldn’t make ends meet and the workers go on strike with Etienne as their leader. I think Zola got the confrontational scenes with the army just right, showing how quickly desperate people lose control in a mob. The despised shop owner comes to a very nasty end at the hands of the women who are a rough bunch due to their circumstances. His depiction of the Chaval-Catherine relationship is so well observed and frankly depressing as the abused Catherine sticks to her abuser for fear of finding something worse without him and ending up a prostitute. Plus ca change – as they say. At the end of the book Etienne is thinking of a future when the workers will organise themselves into unions and win the day. I’m sure I would never have got around to reading Zola without the Classics Circuit, so a big thank-you again and I’ll definitely be reading more of his. I’m going off at a complete tangent here. Etienne couldn’t be expected to imagine having to contend with the likes of Margaret Thatcher, who in the 1980s decided to close down all the mines in Britain, and reader, she did it. I had such a feeling of deja vu whilst reading Germinal because we live in what was a coal mining district and the conditions were terrible even in the 1980s. The mine which was about half a mile from us went under the North Sea and the workers had to crawl for about an hour before getting to the coal face. It was too cramped to stand up and of course they weren’t paid until they reached the coal face. Then they used pneumatic drills (jack hammers) so the noise was horrible. But still they fought for their jobs, they didn’t have to face the army as in Germinal. It was the police on horses. Soldiers wouldn’t have been as bad. We all contributed money to the strike fund but Maggie got her way in the end. I have to thank JaneGS and The Classics Circuit for encouraging me to read Wilkie Collins because I don’t think I would ever have got around to him otherwise. I’m on my third one of his now, (The Woman in White) but I read The Haunted Hotel over the Christmas holidays. Although I enjoyed it I was quite happy that it was a really short one, as I have so much of a backlog now. Lord Montbarry has jilted his fiancee Agnes and married Countess Narona instead. As Agnes is well loved by everyone, they all turn against Lord Montbarry, however it seems to me that he was never a popular person. Even his brothers didn’t seem to get on with him, so the mystery to me is why Agnes was so in love with Montbarry in the first place? But such is life, I suppose. Things don’t go well for the newly weds from the beginning and Lord Montbarry becomes very stingy with money. In an effort to save on hotel bills he rents a dilapidated, damp palace in Venice and his new wife’s ‘brother’ joins them there. The servants who have been brought from England are appalled at the behaviour of their mistress with her so-called brother and decide to leave for home as soon as they can. When Lord Montbarry’s family in England hear that he has died they aren’t too surprised at first but then they discover that two insurance policies have been taken out on him and their suspicions are raised. What had really happened to Lord Montbarry? Well I’m going no further so as not to spoil it for anyone. I would recommend this one as an introduction to Wilkie Collins as it is a lot less wordy than some of his others. I can only suppose that at the time he wrote it he wasn’t being paid by the word – as so many authors were – and that was always a great incentive for them to pad things out. Either that or the opium that he had become addicted to by this time had exhausted him so much that he didn’t have the energy or the inclination to make it longer. First I have to say that I think that the previous reviews of this book have been great. I’m just hoping that I can add a few more things of interest. Edith Wharton won the Pulitzer Prize for The Age of Innocence in 1921. She was the first woman ever to win it. However, her joy was short lived as she discovered that the judges had chosen it because in their opinion it was “the American novel which shall best present the wholesome atmosphere of American life and the highest standard of American manners and manhood”. She had written it to be a satirical and dark comedy of manners, but whichever way you take it, the fact is it is very well written and amazingly detailed, full of social history. I think that Newland Archer underestimates his fiance May as he is under the impression that he will have to educate and mould her to resemble his married lady friend with whom he had had an affair. In reality he gave up on her even before they were married. When he meets May’s cousin, the Countess Ellen Olenska, who has left her husband, he is at first worried that he is going to be affiliated with a family which is about to have a scandalous divorce. However, in the course of his negotiations with Ellen, on behalf of the family who want to avoid the divorce and subsequent scandal, Newland falls in love (lust) with Ellen. Status and family name is all important in this society and Ellen’s family can’t think why she would want to give up her title of countess and become a divorced woman. It has been mentioned that people have found the names a bit confusing, with surnames cropping up as first names often. This still happens in Scotland with boys’ names. The women are reluctant to give up their maiden names completely and so they are given to the eldest boy as a first name or sometimes a middle name. In fact we have done this in our family, we have also used one grandmother’s maiden name. Obviously in 1870s New York society it was important to remind people that they were the product of two wealthy, influential families. I think if they had run off together then it would only have been about six months before Newland regarded Ellen as the trollope who had ruined his life. He would have been miserable living a life being ostracised by the only society that he had ever known. The ever generous May would have welcomed him back though and he might have learned to appreciate her attributes, which he hadn’t managed to do in 26 years of marriage. This was a re-read for me. I read it about 20 years ago when Gore Vidal (whose writing I love), waxed lyrical about Edith Wharton’s writing and I think he was correct.